← Lascaux 3 to travel to Chicago! I still vividly remember the day that my life changed. On a sultry June morning in 1994 my wife, Barbara, and I had just deplaned at Rome’s Fiumicino airport and were on a bus heading north towards Tuscany, tired and jet lagged. Along a non-descript section of autostrada not far from the airport we passed a row of exquisitely canopied pine trees, punctuated by an odd conical cypress. Silhouetted against the sky along a ridge in the gray distance, it was a familiar formation that I had seen depicted many times in Renaissance paintings, but there was something strange here. There were no romantic castles or ancient villas nearby, only gruff retail and light industry – nothing that might justify the careful attention paid to this perfect row, yet these trees seemed as if they were planted and shaped by some master arborist. A few minutes later as our bus slowly negotiated an on-ramp we passed a small field of waving sunflowers nestled into an arm of the cloverleaf. They were planted on a patch of ground so inconsequential that I would almost certainly have expected it to be derelict. Who would take the time to cultivate this little patch of earth? How could it be profitable? I saw my own reflection, faintly superimposed on the bus window glass, and in that moment I somehow sensed that I would never see the world in quite the same way again. Chalk it up to jet lag or sleep deprivation, or perhaps the clichéd “spiritual experience” if you will, but I had something of an epiphany that morning. I was in a foreign country for the first time, on the ground for less than two hours, but I felt as if I had come home. 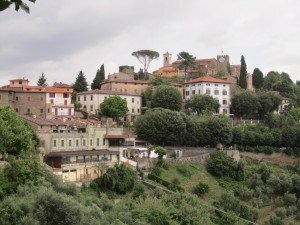 Barbara and I spent the next three weeks in Montecatini Terme, painting in the little hill town of Montecatini Alto and making daytrips to other nearby Tuscan cities and towns. Upon our arrival in Montecatini we began wandering the grid of streets, speculating about every new thing we encountered. Of particular interest were the numerous official-looking, blue and white signs with arrows pointing everywhere. We discussed the wonders of the amazing unknown destination that all these signs were directing us to. We had never heard of the place. It could be a magnificent church or possibly something associated with the United Nations, but surely it had to be a place of great importance because signs all over town pointed to it and all roads seemed to lead to it. On our third day in Montecatini we finally realized that the Italian words, Senso Unico, emblazoned on the blue and white arrows pointed to that exotic place, ONE WAY. Our first Italian mystery solved. But the mystery of the canopied trees remained. Was there a practical reason for this careful shaping and pruning? Why would anyone bother to remove the smallest lower branches, exposing the trunk and main branches, while leaving a luxuriant spread above? It is not just one manicured tree that forms this impression. No – you will find them everywhere in Italy; thoughtfully placed in such precise rhythm that one might think that much of the country was planted according to some master plan drawn by a single great landscape architect. Several years after my first visit to Italy I had a conversation with an Italian about the reasoning behind the canopied trees. He told me that he once had the same question and asked a farmer about the trees planted on his land. Why did this farmer spend the time to trim his trees and what was his reason for placing some on this area of his farm and others on that? The farmer’s reply was, “Because it looks good.” How simple! Beauty needs no rationale. “Because it looks good” is justification enough in the mind of an Italian farmer and so telling about the temperament and sensibilities of the people who over many centuries have coaxed a tangle of green into the great landscape that is Italy. How romantic this vision! How exciting to the senses, and yet, my “canopied” trees were really just another Senso Unico. Nearly twenty years after passing those “canopied” trees on the autostrada I discovered that they were actually Stone Pines, a species quite common to the Mediterranean region. Perhaps I did see the hand of a master arborist at work, but it was not at all what I had believed for so long. Some mysteries take years to unravel. I love the stone pines too, and I’ve always wondered about their uncharacteristic shape for a conifer. Your blog prompted me to check it out on Wikipedia which seems to indicate that the umbrella shape is natural for a mature tree and doesn’t require pruning to achieve it. These are the trees which produce pinenuts, and some people in my village still collect the cones from three trees at the edge of the village. It’s a lengthy process releasing the nuts from the cones in a fire and then cracking each small stoney nut to get at the white edible portion inside.